Board of Intermediate & Secondary Education Bahawalpur organizes the annual and supply exams of 9th, 10th, 11th and 12th class in the districts of Bahawalpur, Bahawalnagar and Rahim Yar Khan which are the southernmost districts of Punjab due to which it is an important educational board. All the private and public institutes in these districts are affiliated with Bahawalpur Board for their matric and intermediate classes. Every year, thousands of regular and private students take part in the SSC and HSSC annual exams under BISE Bahawalpur. Private students are allowed to appear in several humanities’ subjects. Annual exams of maric class held in March and April while intermediate annual exams are conducted by the board in May and June. Bahawalpur Board announces the results of SSC part 1 & 2 and HSSC part 1 & 2 annual exams according to a time table. 9th and 10th class annual exams results are announced in June while 11th and 12th class annual exams results are declared in August every year. 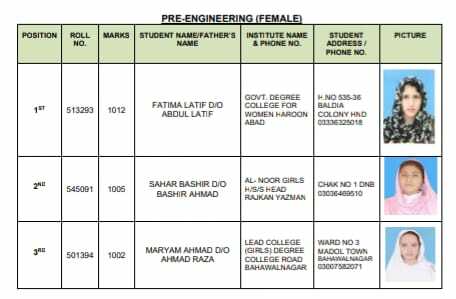 After announcement of results, the results are immediately available at the official website of the board and the students receive their result cards few days after the exams which allow them to take admission in the upper level class. Supply exams of SSC and HSSC classes are held couple of months after annual exams result declaration. Failed students of annual exams take part in these exams while the result of these exams is announced after one month of the supply exams and the result of all the students is available at the official site of the BISE Bahawalpur soon after the result announcement.